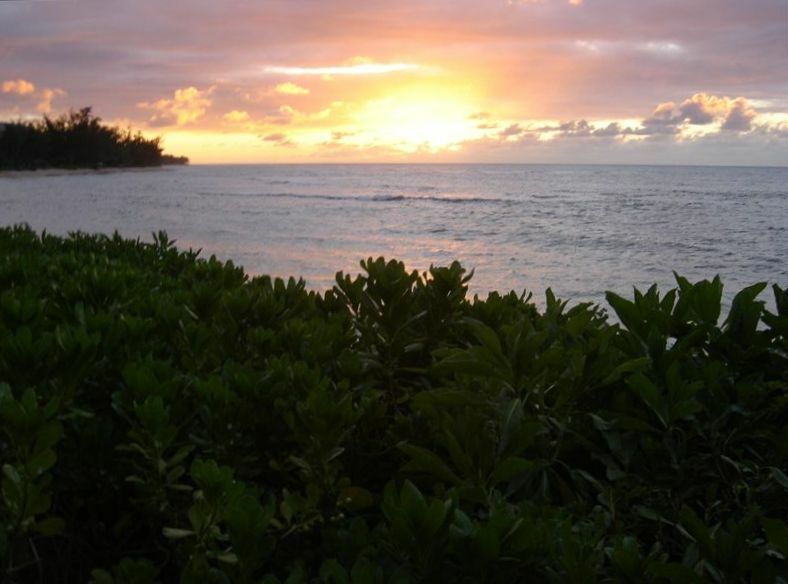 Create a lifetime of memories on the North Shore of Oahu with your family and friends. Our 3 bedroom, 2 bath beachfront home will let your family bond in this very private home. Situated on a quiet road, our gated home sits on 75 feet of sandy beachfront with spectacular views of the ocean and surf. As a newly renovated home, we've featured a gourmet kitchen with slate flooring covering the entire house. Enjoy your meals outdoors in the covered lanai while you watch the surf or catch a glimpse of Humpback whales during the winter months. Cable TV and WiFi are provided, but you'll probably spend most of your time swimming or snorkeling within the protected barrier reef. Work on your tan either on the white sand beach in front of our home, or in our very private yard. Bike around the neighborhood, or venture out to Haleiwa for shopping and causal dining. Families or couples, this is the ideal Hawaiian vacation home. White sandy shoreline directly in front of our property. Great for swimming and snorkeling. Thank you Roy for sharing your home with my family! We had an awesome time. The house had every amenity, including a pack-n-play and monitors for my young child. The kitchen was well equipped and we enjoyed all our meals at “home”. The lanai was a piece of heaven on earth- coffee in the morning, books in the afternoon, and wine at sunset, there was nothing more we could have asked for. The whole yard is enclosed which the kids enjoyed as they ran around with their cousins who visited during the day. The house is a short walk to goats and pigs too! Roy is a superb host and we hope we have the opportunity to come back next year! Thank you!! You will find this piece of the world to be a piece of heaven. The most beautiful beach and mountain views you could imagine! This was a quiet section of the beach as well. The home itself is a typical 3 bedroom ranch home. It had everything we needed. But you spend 90% of the time outside except for sleeping! The owner is wonderful and very responsive. Our family of four had a fantastic week at this beach house! The views were stunning! The backyard was an awesome space to relax, play games, eat etc. We loved the big covered lanai! We barbequed each evening, and one evening it rained as we ate our dinner under full coverage. Everything was so nice and comfortable inside the house as well. It was very fun to have the toys too- the boogie boards, kayak, bikes etc. So many incredible places to go on the North Shore. Some of our favorites were Waimea Bay, Waimea Valley, Sharks Cove for snorkeling, Haliewa, and all the food trucks! We would love to come back again sometime and we have been highly recommending this house to our friends and family. Thanks Roy!! Oh, my. I don't even know where to begin. Roy's place was perfect for our 4 adults and 2 kids (ages 5&7). We ate dinner every night on the covered lanai, spent mornings watching surfers from the stunning margarita deck, and passed hours on the amazing (and nearly vacant) beach right off the backyard. The kids snorkeled independently except for a couple days when there was a current. We saw turtles most days and even a ray...and we all loved taking out the hot pink kayak. If you are looking for a spot off the tourist map with every amenity you could ask for, look no further. This is it. I rented this home when family found out we were going to Hawaii and wanted to join us! It was 6 houses down from the other one I rented. On our last night I asked everyone what they thought about the house they were staying in so I could write a review - expecting some complaining I was shocked that they had not one complaint!!! I had been to the house multiple times and thought it was amazing but Im easier to please than my brother:) They simply raved - the kitchen was amazingly equipped - the house was perfect for 6 - the yard overlooking the ocean was AMAZING - the lg covered patio was used to plan our days and the teacher in the group graded papers there for hours - All the toys surfboards - kayaks - bikes got used and were PERFECT - the hammock saw its share of use - best of all the sitting area overlooking the beach had many books read and photos taken from! Roy was great to work with from start to finish. The sink was slow draining which he told us about before so it was not an issue - im sure he fixed it after we left. WE WILL BE RENTING THIS HOME AGAIN! **** For those of you used to California beaches the water has a lot of rocks so bring water shoes and you will need to watch your kids close - but the temp of the water is amazing and we spent hours in it! OH YEAH this house is out of the main tourist area - we loved it! It was quiet and peaceful and if we wanted to go anywhere it was just a short drive and you were in the hustle and bustle. CAN NOT SAY ENOUGH ABOUT HOW AMAZING THE HOME WAS! This was the second visit to this beautiful home for my wife and I and again we loved it. This time we brought family as well to share with them the north shore. Roy's place again proved to be the perfect location; quiet, comfortable, amazing views and the ocean just steps away. I would recommend this house to anyone wanting a great place to stay away from the hustle and bustle of the larger cities and plan on continuing to come back.